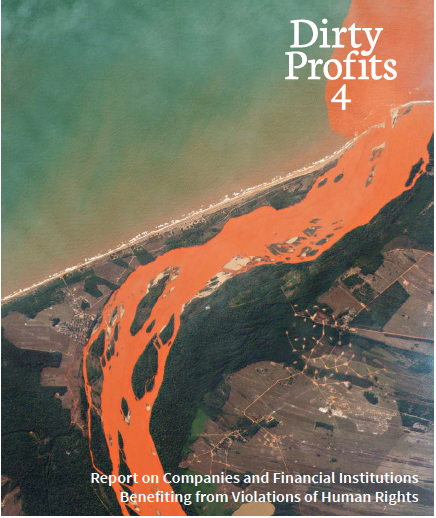 By John Veron – Facing Finance launches its 4th edition of the Dirty Profits report exposing companies and financial institutions benefiting from violations of human rights. Article 1 Collective explains how Israeli banks make their dirty profits (see page 61 of the Dirty Profits report). Israeli banks play a central role in all aspects of Israeli control over the territories it has occupied and colonised since 1967. Illegal Israeli settlements are just one example. UN Security Council Resolutions 242 (1967) and 338 (1973) demand that Israel should withdraw completely from the territories it occupies. Israeli settlements are illegal according to international law and are considered a violation of Article 49(6) of the Fourth Geneva Convention and Article 55 of the Hague Regulations (1907). In 2004 the International Court of Justice confirmed that Israeli settlements have been established in breach of international law. Israeli banks provide mortgages to homebuyers in settlements. The property they buy is used as collateral, as is common practise with mortgage loans. In cases of foreclosure the bank ends up owning that property. Israeli banks provide special loans for residential construction projects in settlements. These loans are provided under specific terms, which are regulated through “accompaniment agreements” under the Israeli Sale Law. The terms ensure that a bank guarantees the construction project, backs the construction company, and protects the buyers’ investments by providing a bank guarantee. Prior to an accompaniment agreement, the bank appoints somebody to examine the profitability of the project. Sometimes the bank holds the real estate property as collateral until all housing units are sold. The payments of homebuyers are deposited in a dedicated bank account, and the bank monitors the financial status as well as the development of the project. Usually the bank is also involved in determining the price of the apartments and the schedule for completion of the construction. The bank forms a close partnership with the construction company and is thus deeply implicated in settlement construction. Israeli banks provide the financial infrastructure and services to settlement authorities. Regional councils, local councils and municipalities of Israeli settlements in the occupied West Bank and the Golan Heights depend on these services. The banks provide a wide variety of services including managing bank accounts and transfer of funds from the government and other sources for the settlement authorities to govern the municipalities. Israeli banks also provide loans, which are used for the development of infrastructure, the construction of public buildings and for providing municipal services, like electricity, health, transportation, education etc. The provision of these loans makes the banks investors in the continued development and prosperity of the settlements, as the future income from taxes and other revenues are provided as collateral. Israeli banks operate branches in Israeli settlements. Through these branches banks provide financial services to settlers and companies in settlements. The bank branches are part of the service infrastructure that enables the development and expansion of the settlements and constitute a direct physical presence in the settlements. In addition, Israeli banks directly participate in the settlement economy as municipal tax payers. Israeli banks provide financial services to businesses in settlements and to businesses whose activity is related to the occupation. For instance, Israeli banks provide loans to factories operating in the industrial zones of settlements, or whose main activity is the construction of settlements, or infrastructure projects for the use of Israeli settlers. The property of these businesses is often used as collateral, making banks the property owner in case of bankruptcy. Another well know example is the funding of construction and operation of the Jerusalem Light Rail, which connects Israel to Israeli settlements in violation of international law. Israeli banks do not differentiate between Israel and its settlements and Israeli law prohibits them from doing so. Israeli settlements are illegal according to international law constituting a war crime and a violation of numerous human rights. Israeli banks do not just facilitate, but are an integral and essential part of the ongoing development of Israeli settlements, and thus also responsible for the related breaches of international law and human rights violations they constitute. Institutional investors, both owning or managing shares in Israeli banks condone the illegal and ongoing construction and expansion of Israeli settlements and profit from it. Financial institutions should realise that their investments ignore the UN Guiding Principles on Business and Human Rights, the OECD guidelines in which these are fully incorporated, and principle 1 and 2 of the UN Global Compact. For legal and ethical reasons it is clear that investing in Israeli banks is unacceptable. Not only ethical investors who claim to consider human rights when making investment decisions, but all institutional and private investors should realise the legal, financial and reputational risks involved in such investments and should accordingly divest from Israeli banks.